S. Tillim, Lindner, Chicago, Londres, 1961, repr. fig;11. D. Ashton, Richard Lindner, New York, 1970, repr. pl. 63. P. Gorsen, Sexualasthetik; Grenzformen der Sinnlichkeit im 20. Jahrhundert. 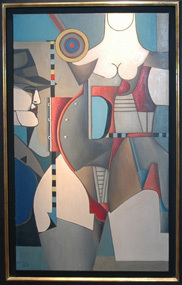 Rowolt, 1987, repr. fig.108, p. 264. 1963-1964, New York, Museum of Modern Art; Ottawa, National Gallery of Canada; Missouri, Artists’ Guilt of Saint Louis; Ohio, Toledo Museum of Art; Sarasota John and Marble Ringling Museum of Art, Colorado Springs Fine Arts Center; San Francisco Museum of Art; Seattle Art Museum, Detroit Institute of Arts. Americans. 1969, Berkeley, University of California; Minneapolis, Walker art Center, University Art Museum Lindner, repr. n° 28.